Today, I am very happy to welcome a very dear friend, Shailaja, to my space. I came across her parenting blog a couple of month’s back, and the first thing that caught my attention was the Yelling Less counter on the sidebar. It read over 150+ yell free days at that point. 150+ days since she last yelled at her daughter. That intrigued me. If I were to ever keep such a counter, I would reach 3 days at my very best. So, I decided to browse through her posts on Yelling Less and I was hooked. She has a style of writing which makes you feel that she is talking directly to you/reader and that makes it more of a conversation than simply information. It is my honour and privilege to host Shailaja here. Thank you for this post, Shailaja. Anyone who has ever been a parent knows the overwhelming need to yell when things don’t go as planned. Some of us control the urge, others divert the yell and most of us just give in to it and let the people around us hear our voices’ loudest tones. Yelling Less is a goal I set for myself back in 2013, as a week-long exercise. From there, it’s been a journey of ups and downs in the yelling department but mostly, it has been a journey within. It’s now been over 220 days since I’ve yelled at my daughter. So what does that make me? A good parent, a motivated individual or an inspiration to many? The answer is – none of the above. 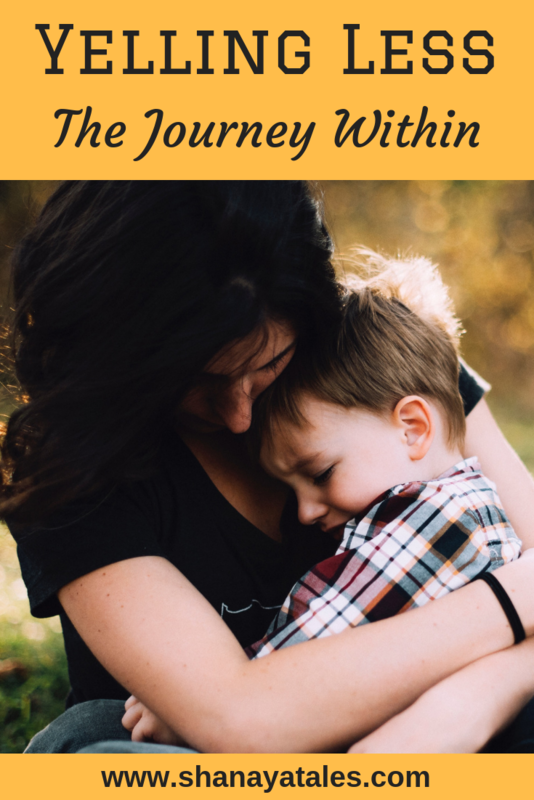 Quite simply, because, this is a journey that I undertook to surmount one of my biggest challenges as a parent and suffice to say that it has led to far deeper insights as an individual than merely lowering my decibel levels. Yelling at our children primarily implies three situations that need tackling at the parent level. One, it is the parent-child power dynamic where one feels empowered over the other by virtue of age. Two, it is the inference that the child is ‘defying’ the parent which warrants a yell. And three, it’s the parent’s complete exhaustion at any point during the day that triggers the yell over the slightest form of disobedience. I’m simplifying here, of course, but what we need to remember is that each of those scenarios can be tackled with a slight shift in perspective. In the parenting group that I run, we conduct monthly challenges, post daily tips for yelling less, offer support and empathy for those who have yelled, inspired by the principles of The Orange Rhino. Anyone, at any given time, is capable of change. It merely requires the inspiration and motivation at the right time. Never judge another mother/person for the behaviour that she exhibits- for you know not the singular travails of every individual you come across. 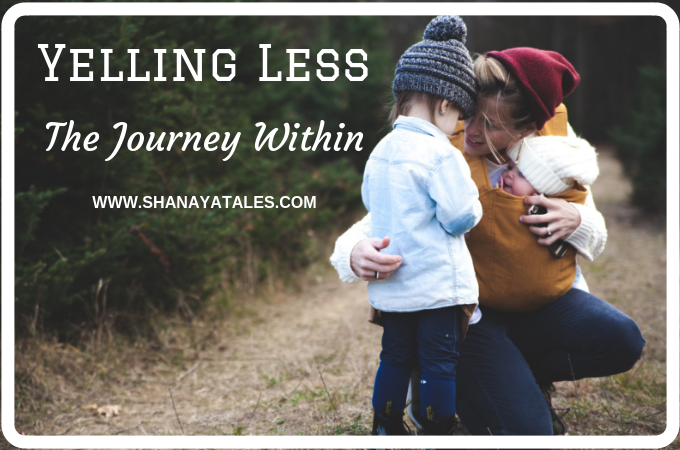 So, in a way, Yelling less at my daughter was the trigger for the journey into my own soul. For that, I shall be eternally grateful to her. Thank you, Shantala, for this opportunity to write a guest post for your blog. I am honoured and feel privileged that you reached out to me. Shailaja Vishwanath is a freelance writer, editor, content developer and blogger who shares life lessons on parenting on her blog Diary of a Doting Mom. Her short stories, poetry and tips for writing can be found at The Moving Quill. She also runs a support blog for bloggers, Blog-A-Rhythm, where bloggers come together to learn and grow together on this writing journey. She counts parenting, reading, writing, swimming and social networking among her top passions. Connect with her on Facebook, Google Plus and Twitter. Such a lovely post, Shailaja. I have a long way to go before I yell less. Those little monsters, I tell you. 🙂 But yes, I would like to have my Zen persona from the time before I had kids back. This is a really bad time to read this post as both of them are doing tandav on my head as they are home. 🙂 Jokes aside, yes, it is a challenge for a parent not to yell. Like you said, you can never know what another mother is going through. The one next door yells so loudly that I almost wet my pants. I used to feel very sorry for her daughter till I had first-hand experience with her. She is such a difficult child. So, anyhow, I am glad you took up this challenge that took you on this journey inside you. I must too, hopefully soon. So nice to have you on Shantala’s blog! I yell at the table when I hit my shin on its leg, the gas stove, when the milk boils over 🙂 seriously, not yelling at your child is a beautiful thing to do. Patience and lots of patience is the key requirement here and of course lots of love. We all love our kids but lack patience, must try not yelling at inanimate objects first. Ha ha ha Sulekha, you crack me up 😀 Hitting the table leg seems like a better option to yelling, actually. At least the anger gets dissipated. Poor leg, though. Yours, not the table’s 😉 Agree that patience and perseverance are key. Raj, have you not heard of the term ‘Appearances are deceptive’ ? 😉 I can really lose my temper and most often, my daughter has borne the brunt of it. It has changed a lot in the last year, I am glad to say. Now I restrict myself to controlled glares and a serious tone of voice. Thanks for your love! Very thought provoking post, Shailaja. Thank you so much for reading and commenting, Shail! This is a good post. I used to teach English in Japan to classes of young children (average age ~8 years old). The teaching style used games to teach English so the classroom had no desks, just a padded floor and toys. With a bunch of hyped up kids things could get hectic. When first teaching I’d yell sometimes. And it sometimes worked. But over a few years I learned I had much better success by not yelling, plus I didn’t end up feeling the idiot by yelling and having the kids just ignore me. Tim, I completely agree with the ‘yelling and having kids ignore you’ bit 🙂 It can be seriously frustrating plus it doesn’t have the desired effect. I am fascinated by the concept of no desks in the classroom. How wonderful! Wow, this is very inspiring! Congratulations on the journey and achievements! Thank you for sharing this post. I’m going to have to follow her blog and start from day one. How lovely to see Shailaja guest posting here!! Seriously though, you are quite right about the three basic reasons why parents yell and it’s good to be aware of it so you can bring about change! Roshni, you are such a lovely addition to my blogging journey in the recent past, one I am eternally going to give thanks for 🙂 As for the yelling, you work best with what works for you 😉 As for the no effect whatsoever, I wonder if the kids are now used to the yell 😉 Try leaning in and whispering next time. Much scarier. I guarantee it 😀 Thanks for all the love and support. You rock! I try not to judge other parents when I see them yelling at their child. I can say I honestly hardly ever raised my voice to my children and that includes the thousands of teenagers I taught. It was kind of joke that I could give them a look and they would say, ‘stop yelling at me.’ That’s when I knew we understood each other. This was a very insightful post. Susan, I bow to you! And if a look of yours could rival a yell, you are my newest inspiration 😉 Thank you for reading and for being so warm in your praise. Much love and gratitude! elly stornebrink recently posted…#A to Z Challenge: Y is for … Yes! Yearning for Yourself! I am not a parent yet but this post truly is an enlightening one. As a parent I know how hard it is to control one’s anger towards the child when he/she is being disobedient. Kudos to Shailaja for achieving this and I shall take inspiration from her and see if I can follow her steps. 🙂 Good post Shantala and thank you for sharing Shailaja’s wise words here. High Five there!! I don’t yell or hit my kids too. Their bodies are too small to take a hit and their minds are too fragile to understand all the crap we dole out!! they will grow up sooner than we know and then they will also grow apart from us…which is scarier! I think we can still be firm with them without having to yell at them. Nice to read this post, it is very inspiring … not easy to practice, but its worth the effort. thanks shailaja & shantala for this post. Loved the Yelling Less post. I always realized that I’d lost any advantage and a good deal of self-respect when I resorted to yelling at my boys, and there were so many times that yelling seemed absolutely necessary. “Never judge another mother….” So true. Yelling happens. I never step in unless the yelling escalates into something physical. I can’t stand to watch a parent physically overpower a child. 1 – Realize and accept your mistake. 2 – Apologize sincerely and explain to your kids why you blew up. I believe this has worked in showing my kids that although we may lose our cool from time to time, our hearts are always in the right place. By accepting and apologizing, I also show my kids that even grownups make mistakes, and that intention and sincerity are what’s really important. My mother never explained anything to me, or apologized… ever. In her generation, in her culture, the mother is always right even when they are wrong. I know that way of thinking has created a rough relationship between us, and I’ve learned from it. Explaining emotions sounds advanced for a young age, but I’ve explained things to my son since he was four. They get it. Kids are wiser than we give them credit. Beautifully put Tanya. Explaining and apologising really work wonders. That and not beating ourselves up when we slip up. These things happen. Love your detailed comment and insight. Thank you so much! I know exactly what you mean, Shilpa. That look of fear, cowering and being scared. One of the few things that triggered my resolve. Glad to hear that you took it up as an attempt. Yep, being firm without yelling has begun working here. Some days are really hard though!